A stunning new report reveals that the United Nations Children’s Fund (UNICEF) has been monitoring independent health sites and their users in an attempt to identify ‘anti-vaccine influencers’ and their effect on lackluster vaccine uptake. A newly fashioned United Nations Children’s Fund (UNICEF) working paper tracking “the rise of online anti-vaccination sentiments in Central and Eastern Europe” identifies independent health websites, including GreenMedInfo.com, Mercola.com, NaturalNews.com and VacTruth.com, as contributing to lackluster vaccine uptake (We hope to make next year’s list! – Ed.). 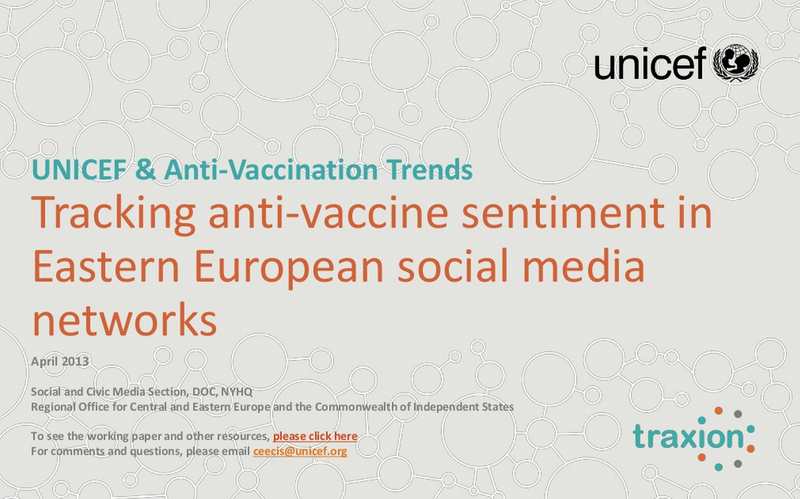 The UNICEF report, titled “Tracking anti-vaccination sentiment in Eastern European social media networks,” obtained data using “state-of-the-art social medial monitoring tools,” and confirmed that parents are using social media networks to decide whether to vaccinate their children. 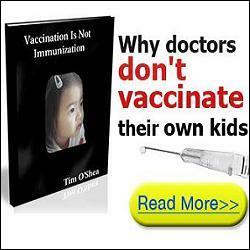 Why parents are refusing vaccination? What are the concerns about vaccines? Who is influencing the discussion? Which networks are being used? UNICEF’s opening reference to the “lie” (misinformation) spread by the above-mentioned web-based organizations indicates that while the document purports to be analytical and descriptive, it has proscriptive and defamatory undertones, and only thinly conceals an agenda to discredit opposing views and voices. Slide #30 from the PPT presentation of the report. UNICEF’s derogatory stance is all the more surprising considering that websites such as GreenMedinfo.com aggregate, disseminate and provide open access to peer-reviewed research on vaccine adverse effects and safety concerns extracted directly from the US National Library of Medicine, much of which comes from high-impact journals. [see data set here: vaccine research ]. In turn, websites such as Mercola.com and NaturalNews.com often simply cite the same data and report on its implications. 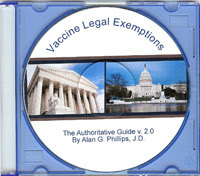 Labeling research that contradicts or questions the unilateral view that vaccines are always safe and effective, or that their benefits always outweigh their risks, as “anti-vaccine,” or the sites that host or discuss that information “anti-vaccination,” is polemic and disingenuous. Indeed, insofar as many of the sites UNICEF labels as “anti-vaccine” consistently cite peer-reviewed and published research, they risk indicting the credibility of their own global immunization agenda, which is ostensibly based on the same “evidence-based” epistemological model. 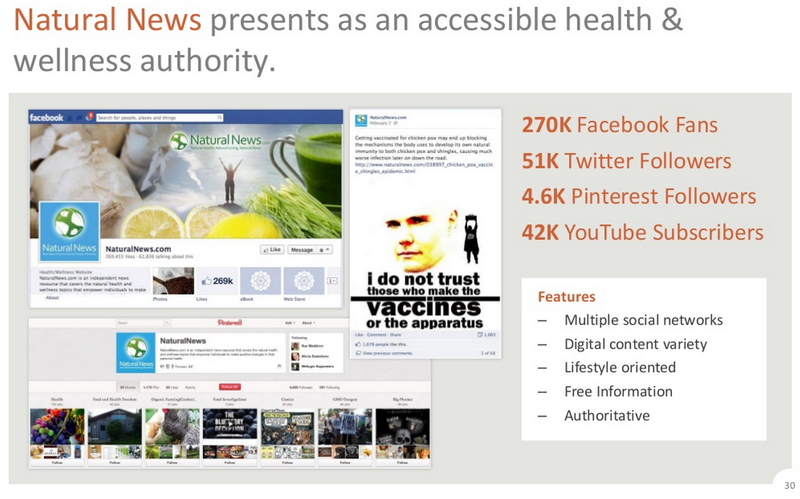 Slide #41 from the PPT presentation of the report. Researchers have selected social media channels, languages and formulated key word strings for online searches from 1 May till 30 June 2012. Messages from over 22,300 participants using English, Russian, Romanian and Polish were monitored by volume (using mentions, views, postings), by channels through which users exchange content, by engagement (how users respond, like, share) and by sentiment analysis to detect positive and negative attitudes. The authors of the report note ‘ethical considerations’ in gathering and analyzing the web usage behavior and data of 22,300 tracked users, but claim that by not publishing the specific IP data in their report that their work does not break any laws, even if it may violate ‘moral’ codes of those who were subject to uninformed surveillance. In all four languages, blogs are the most frequently used channel followed by Facebook. Twitter is the second largest channel in Russian. Most of the interactions are taking place in forums. While female audiences tend to focus on issues such as developmental disabilities, chemical and toxins, and side effects; men focus on arguments around conspiracy theories and religious/ethical beliefs. Participants discussing anti-vaccination sentiments are 56 % female and 44 % male. During the observed time period, more messages in English are recorded using key words stemming from conspiracy theories, distrusts against governments and pharmaceutical industry. Religious and ethical beliefs, distrust against U.S. and western governments drive the Russian language discussions. 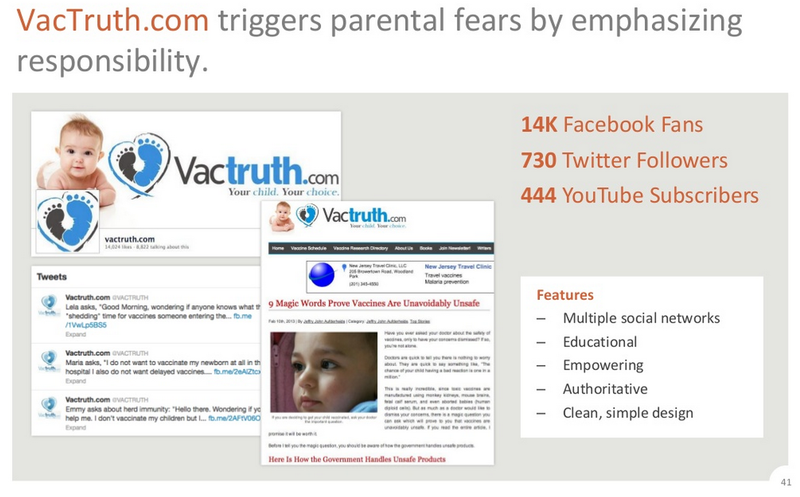 Anti-vaccination opinion leaders in the online world show varying characteristics. Some have no college education while others are in the medical field (such as nurses). Often they appear well educated in alternative medicine and subscribe to social channels of homeopaths and alternative medicine advocates. Sayer Ji is an author, researcher, lecturer, and advisory board member of the National Health Federation. He founded Greenmedinfo.com in 2008 in order to provide the world an open access, evidence-based resource supporting natural and integrative modalities. It is internationally recognized as the largest and most widely referenced health resource of its kind.